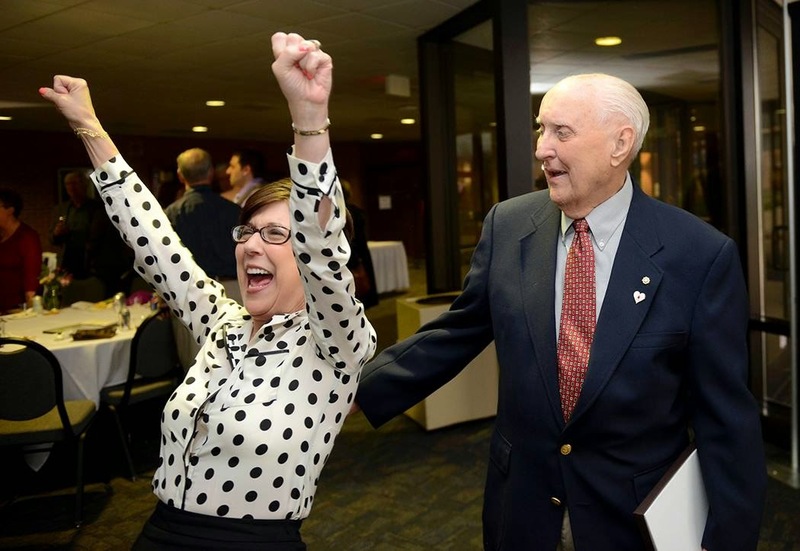 The University of Illinois Springfield Volunteer & Civic Engagement Center and the Junior League of Springfield honored more than 50 Sangamon County volunteers and businesses during the annual Good as Gold Ceremony. The event was held on Wednesday, April 23, 2014 in the Sangamon Auditorium Lobby at UIS. Glenn Allison, an 84-year-old lifelong resident of Sherman, was honored with the 2014 Distinguished Volunteer Award. Allison volunteers a minimum of 15 hours a week at Memorial Medical Center and 10 hours weekly at the Illinois State Military Museum. This year marks his 21st year as a volunteer at Memorial and 12 years as a volunteer at the Military Museum. He is a veteran of the Illinois National Guard and served in the Korean War. Allison considers his volunteering a serious commitment. He firmly embraces the mission statements of both organizations, as if he was a salaried employee. As a younger man, Allison served on several boards and committees for the Village of Sherman, St. John Vianney Roman Catholic Church, The Knights of Columbus, Kiwanis Club, and other professional organizations. He was awarded a plaque from the Sherman Volunteer Fire Protection District for his 32 years of exemplary service and dedication of the highest level. Finalists for the Distinguished Volunteer Award included A. Edward Hohenstein from Habitat for Humanity of Sangamon County, Mark Puczynski from Springfield Public Schools, Thomas Tomlinson from the Lincoln Home National Historic Site, and Mary Yokem from the Foster Grandparent Program. UIS student Mallory Beck of Springfield was honored with the Star Student Award for her volunteer efforts. As vice president of the UIS Student-Athlete Advisory Committee, she’s helped organize clothing and food drives, trips to nursing homes, and a “Kids Night Out” fundraiser for the Make-A-Wish Foundation. Beck is also planning a “Sports with Diabetes” camp for children afflicted with Type 1 Diabetes and their families on May 3, 2014. Other UIS students nominated included Matt Dobill, Jill Gossett, and Fred Jackson. The Star Staff Award was given to Pamela Hammond-McDavid for her work with the UIS Volunteer & Civic Engagement Center, her service to Grace United Methodist Church’s National Commission on Religion and Race, and for serving as a founding member of the Good as Gold Committee. Community member Katie Engle from West Side Christian Church was honored with the Youth Volunteer Award for efforts to coordinate and a two-day community Thanksgiving meal at Harvard Park Elementary called “Feast for 500”. She also helped with another effort to provide pajamas and books to Harvard Park students. She continues to be an active supporter at Harvard Park as a reading mentor, 'room sister' and office helper. Others nominated for the award include Abigail Judge, Katelyn Judge, and Erin Monroe. Thirty local volunteers were also honored with the Heart of Gold Award. Recipients included: Grace Adloff, Jo Ellen Bretz, Judy Brown, John Craner, Debra Elmore, Lynn Evans, Scott Gauvin, Timothy J. Granzeau, Pauline Halm, Pam Hargan, Lisa Higgs, Wes King; Ted LeBlang, Sandy Linehan; Faraji Martin, Ikenna Martin, Nancy Eckert Martin, Harry McKinney, Joan McKinney, Cindy Murdock, Beth Nestler, Jeff Patton, Christine Phillips, Deb Philo, Deanna Planitz, Megan Swanson, Angela Try, Joyce Wilson, Mary Jo Woolsey, and Beth Yong. Springfield Health Check was recognized with the Organization Agent of Service Award for its contributions to the community. The organization offers free health fairs for businesses and organizations. The group works one-on-one to set up wellness programs with local businesses and organizations to improve health, engagement, and productivity. Others nominated for the award include Habitat for Humanity, First Christian Church, and the 21st Century “R” Rescue Team. A total of 12 Sangamon County businesses were named to the inaugural Business Honor Roll, sponsored by the Springfield Chamber of Commerce. The honor roll recognizes businesses that have made giving back to our community a priority. Businesses making this year’s honor roll include America Ambulance Service, Bank of Springfield, BUNN, CEFCU, Illinois National Bank, Kerber, Eck & Braeckel LLP, Noodles and Company, the Orthopedic Center of Illinois, PJP Auto Enterprises, Quaker Steak & Lube, SCHEELS, and Terry Farmer Photography.